I’m having a game night tonight, and we might be playing one of my favorite new games: Mysterium. 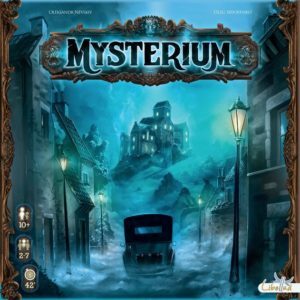 And as I think about the gamification of my classroom, I can’t help but to think about how a game like Mysterium would fit into the mix. Mysterium is a totally amazing game for a number of reasons: it’s cooperative, there are no words, and it’s extremely unique. The basic premise of the game is that one player plays a ghost, giving mediums clues to people, locations and objects through cards that the ghost draws. The ghost is not allowed to talk and can only communicate to the other players by giving them cards that work as clues to help the players get to their personal conclusion. But the other mediums can help each other decipher the clues distributed by the ghost. Here’s why it’s good for the classroom. This game requires a ton of inference. It requires players to work together to figure out clues and find connections between cards. And inherently, this game deals with tone, mood, and characterization. Not only are you teaching literary skills in the English classroom with this game, but this game is straight problem solving. I know I feel smarter when playing it. It’s sort of like an escape room without all of the hassle of setting one up. That also brings the benefit of players working their brain without knowing it…because it’s fun! The artwork on the cards is amazing, and the way the game plays out, you could create a story for each player’s history. This game does a great job with all of the above, but it also works on aspects of story telling. And since there are no words, there are no barriers for lower readers or language learners. Remember, images are fairly universal. If you, your friends, family, etc., are into gaming, and you have not yet played Mysterium, go buy this game yesterday. Then buy five more and build it into your curriculum. Your kids will love it!